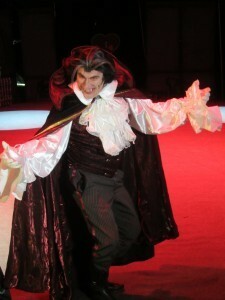 The Roman Show visited The Vampire Circus this afternoon at Bayfront Park. The circus starts October 18, 2012 and run till October 31, 2012. Here is a sneak peak of the show filled of vampires and Dracula. Visit www.thevampirecircus.us to purchase tickets. See you at the show and listen to director Francisco Javier Santos, who speaks about the circus and what to expect.